Build the Greenway through a network of parks alongside the river— the entire length of the river, as close to the river as possible— wherever that is achievable and ensure that the Greenway links to the extensive network of existing Bronx greenways and bicycle paths. , This is of course a long-term goal,but it starts with strategic connections, such as linking Depot Place Park to Roberto Clemente State Park via the Regatta Greenway. The Harlem River Greenway won’t happen without a comprehensive vision and a plan to guide improvements on both publicly and privately-owned sites.The Greenway should incorporate green infrastructure technologies including green swales, porous pavement and soil bioengineering to capture storm water. Provide on water access to the river through multiple “doorways,” and make sure that streets leading to the river are clear and inviting pathways for the public. This means providing multiple ways for people to get onto the river, whether by human-powered boats or larger-scale water transit. In addition to necessary grey infrastructure engineering investments that capture and remediate storm water runoff with a goal of eliminating combined sewer releases, clean the water by expanding the use of natural sustainable storm water management practices. Green infrastructure systems should incorporate green swales, enhanced plantings and soil bioengineering practices in the upland areas and leading to the river’s edge. Make the river safe and attractive for swimming, boating, and fishing. Anything built along the river should contribute to improved water quality through the capture of storm water and should create a healthier, more attractive urban environment. Build upland connections carefully, prioritize existing need,(such as access where there is population density and transit) and always consider how people get to the water. Enhancements to the Harlem River should contribute to improving the health and mobility of the surrounding neighborhoods. Improvements along the water should improve the communities’ connections to each other, and to the river. These inviting pathways (multiple doorways) should lead to recreational water activities as well as transportation by road, rail, boat or bike. Restore the edge by naturalizing, where possible, the river’s edge to begin to capture non-point source runoff, while providing habitat to critical invertebrates and fish. In 2011, the Harlem River watershed was designated one of seven Urban Waters Federal Partnership pilot locations, selected to restore and stimulate the local economy and improve quality of life and health in underserved communities. Harlem River restoration is also a priority of the USEPA’s NY/NJ Harbor Estuary Program, and is highlighted in the America’s Great Outdoors Initiative of the federal government. Much of the Harlem River lies in a Hurricane Evacuation Zone. As our coastal waters continue to rise, restoring and protecting the edge through land conservation provides a buffer to the community and protects the economic interests of our neighborhoods. The Greenway is an opportunity to think differently about how the community can use the river—for recreation, for exercise, for economic development, for culture and education. A safe waterfront is one enlivened by programming and facilities that function at all hours and educate people about the use of the river and how to be safe on or in the water. Building the Greenway creates jobs during construction and enhances real estate values when completed. Educational/cultural programming, waterfront restaurants, boat storage/rentals, enhanced fishing opportunities, and other allowable maritime uses create both construction and long term-employment and entrepreneurial opportunities. Sustainable storm water management practices, creation of the Greenway at the water’s edge, and waterfront pathway access should be guaranteed in return for economic incentives all along the Bronx waterfront. The Harlem River stretches 9.3-miles to form a natural boundary between Manhattan and the Bronx and links the East River to the Hudson River, and flows into Long Island Sound. It is a rare and valuable urban landscape: a river flanked by sheer cliffs and forested slopes coupled with monumental and historic infrastructure including fifteen bridges, the Old Croton aqueduct, and a viaduct – The High Bridge. While most of the river’s edge is fill, many natural areas are still in place as small sections of tidal wetland habitat adapted. The Harlem River has the potential to serve as a sustainable model that will enhance the recreation and ecological value of the region. The river connects diverse neighborhoods: Spuyten Duyvil, Kingsbridge, Marble Hill, University Heights, Morris Heights, High Bridge, Port Morris, and Mott Haven. When the Greenway is built, some of NYC’s neighborhoods in greatest need will finally have access to one of the city’s most beautiful natural landscapes. There is a dramatic juxtaposition: on the one hand, the river is a unique natural asset that historically provided a recreational center for regattas and small boating, with dramatic views of the river from high bluffs on both sides, connected two boroughs, and allowed a thriving economy to flourish upon the waterfront. On the other hand, the arrival of the Major Deegan Expressway in the 1950s separated the public from the river. Parks on both sides of the river were abandoned, piers rotted, and the High Bridge Promenade that linked two boroughs high above the river was closed. Poor public policy allowed random, inappropriate uses to pop up along the river’s edge, adding pollutants to a river no one could reach, enjoy, or protect. There are currently only two publicly accessible parks, no continuous bicycle or pedestrian pathway or connection to upland communities, and only very limited on-water access. Meanwhile, Bronx residents are cut off from significant open space and pay a heavy price in terms of public health; the Bronx has the country’s highest rates of asthma (51% of adult emergency room visits were for asthma), and high rates of obesity (affecting 31% of adult Bronx residents), and diabetes (affecting 12% of adult Bronx residents). Community members are denied the public health, aesthetic, and recreational benefits of the natural environment.. Tantalizingly close, but in every practical sense, very far away. The Trust for Public Land has a long history of partnering with local organizations to create waterfront visions—greenprints—that recommend and inspire protection, conservation and restoration of urban waterfronts. The Harlem River Working Group (HRWG) is a coalition of nearly 50 community groups, city, state and federal agencies, and elected officials focused on improving access to and along the Harlem River in the Bronx. The group’s goals are to work toward restoring the Harlem River, reconnecting the waterfront with the people, recreating the water’s edge; and reinvigorating recreational and commercial activities on the water. 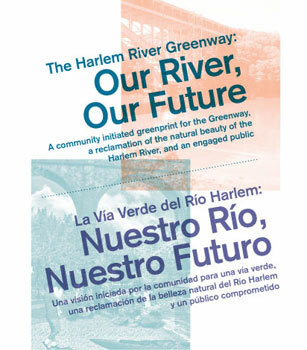 For a decade, HRWG has advocated the creation of a Harlem River Greenway. Inspired by a vision of a Bronx-wide system of Greenways (best exemplified by the spectacular reclamation of the Bronx River for the public, and the 40-year-old national goal of swimmable, fishable waters), HRWG has successfully nurtured the reopening of the historic High Bridge and partnered with the Trust for Public Land, The Port Authority of New York & New Jersey, and NYC Parks on the acquisition of Depot Place Park. . The group and its member organizations are using every opportunity to ensure that all investments along the river build toward the creation of the Greenway. HRWG joined with the Trust for Public Land and students and staff from Pratt Institute and the Pratt Center for Community Development to engage the public in the creation of a vision for the Harlem River. Four community workshops were held in the Bronx during the spring of 2012, where participants used maps to show their connections to the water and talk about their ideas. The vision presented here represents a melding of ideas from over 30 years of existing plans as well as new ideas from residents and other stakeholders garnered during the process.